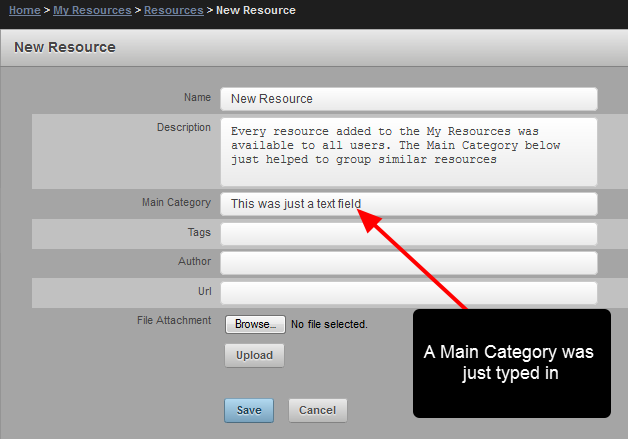 You may already have a number of Resources Stored in your My Resources Module. Most of these will be available from a Category that has been written in when the Resource was uploaded. These were text based categories and could not be used to restrict access. Because access to ALL existing, and new, Resources will be set based on the Categories a user is assigned, all of the existing Resources on your system will need to be set to appear in a specific Category. 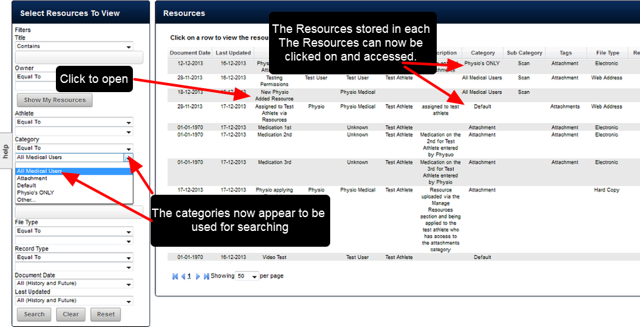 However, all of your existing Resources will automatically be categorised for you when you log in to the admin area. -The Text based Categories that each Resource was originally stored in will be used to create new Categories that appear in the Category Module on the Administration Site, AND in the list of Categories for users to select to upload new Resources into. Each Category has different documents and files stored in it. E.g., the S and C file contains files pertaining to testing, video, iOS systems etc. The Main Categories were used to group the files. Categories were set up, but they did not restrict access. They acted as a storage point for similar files. The example here shows an existing Resource on the main application that was on the system before Category Options were available. Any Resource that had a Main Category listed for it (e.e.g as shown in the image in the step above) will automatically be recategorised into this Category. This Category will also then appear in the Categories Module on the Administration Site. N.B. However, the new Category called "Monitoring" will need to be assigned to applicable users via the Roles on the Administration site before any user will be to access this Resource. On the main application, because all Resources must now have a Category all existing Resource must be recategorised. The example in the step above showed a resource that had a Main Category listed for it (Monitoring). However, some existing Resources did not have a Main Category written for them. To ensure access can be assigned to these non-categorised Resources, they will all be added to a new category called "Historical". N.B. In the example here the Category called "Historical" will also need to be assigned to applicable users via the Roles on the Administration site before any user will be to access the Resources in this Folder. Each system will have different Categories set up. These will be set based on the Categories that you require. They will also be set up based on an existing Categories that you had before the predefined categories were built into the system (for more on this see the article on Existing Resources) . N.B. These are ONLY the name of the Categories and Subcategories. All documents are still stored on the main application. 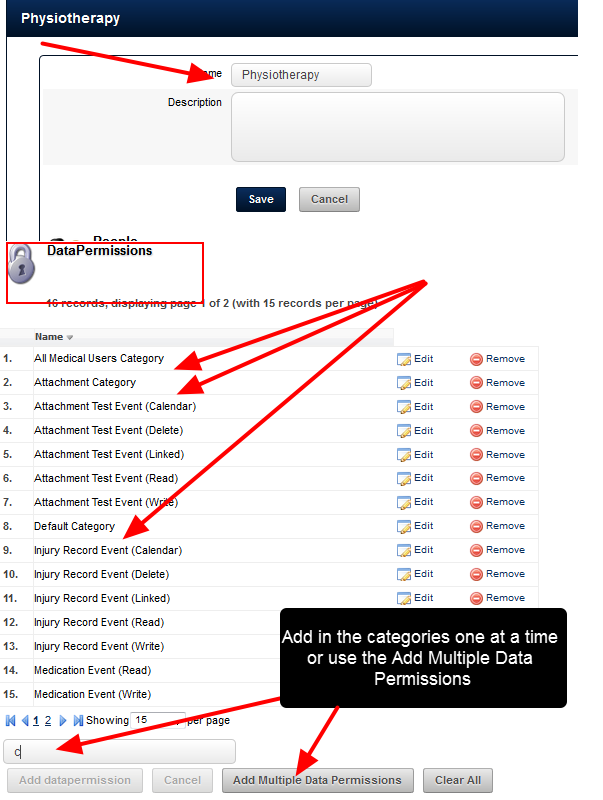 However, the name of each Category is now set ONLY the Administration site so that access to these Categories can be set alongside access to Event Forms, Databases etc via the Data Permissions in a Role. Even though all of the existing Resources will be recategorised according to the previously listed Main Category, or into a Default Category, no one will be able to access ANY Resources on the system. This is because each Resource is now assigned to a specific Category.When the new upgrade is rolled out the system does not know which category to assign to each different type of user (e.g. Role). Because we need to securely enable access to the Resources within each Category, all Resources will be hidden from the users until they have been given permission to that specific Category as part of the users' Role/s. 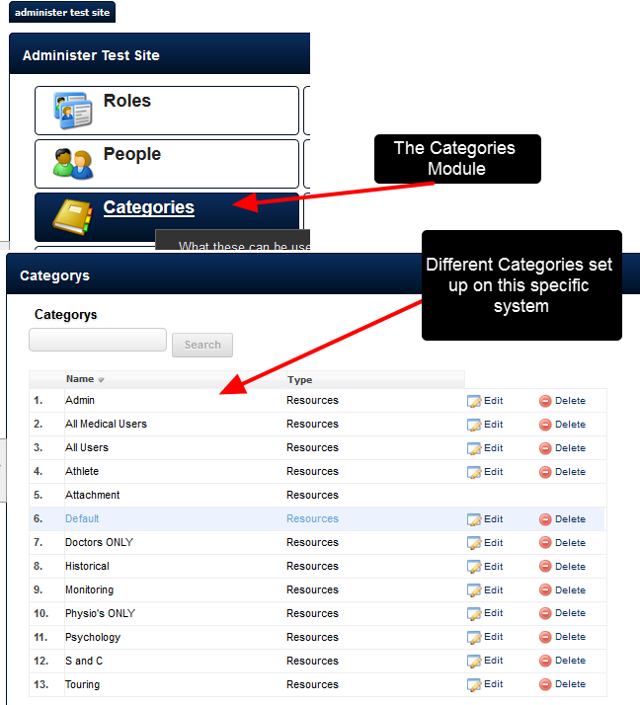 To assign access to a category, go to the Roles Module. The example here shows that the Physiotherapy Role is going to be selected to add in specific Category permission to access the Resources and Attachments stored within the assigned categories. The example here shows that the Physiotherapy Role is being updated so that users in this Role can access a newly created "Physio's ONLY" category, as well as a newly created "All Medical Users" category. They are also given access to the "Historical" category as well so that any previously un-categorised Resources will still be available to them. The Role is opened via the Roles Module, and category permissions into the "Data Permissions" section of the Role, and they are added in exactly the same manner as Event Form, Profile Form, and Database Permissions. Administrators search for the category and then add it into the Role. Once added, user in the Physiotherapy Role will now have access to ALL of the Resources in the Physio's ONLY and the All Medical Users Categories (as shown in the image below). They will also have access to any new Resources added into this field. N.B. 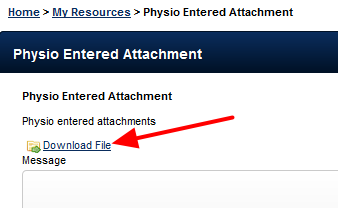 If your system is set up for Event Form Attachments to be enabled as Attachment-Resources, any attachment uploaded into the Physio's ONLY, the All Medical Users and the Historical categories will be available to Physiotherapists as well. 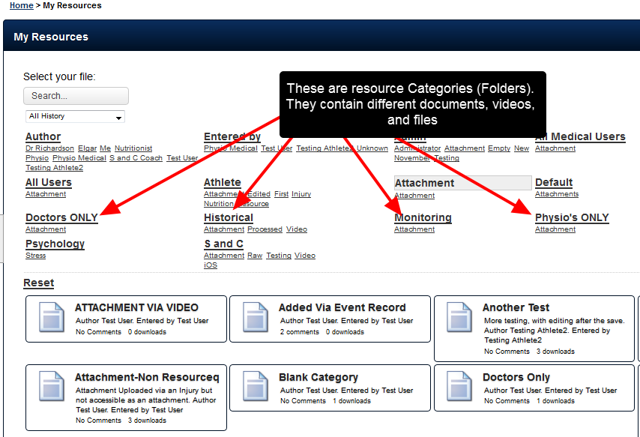 If your system was set up with Attachments that have been changed to Attachments as Resources, it may be pertinent to enable access to the Category called "Attachment" so that they can continue to access historically uploaded attachments uploaded to Event Forms. 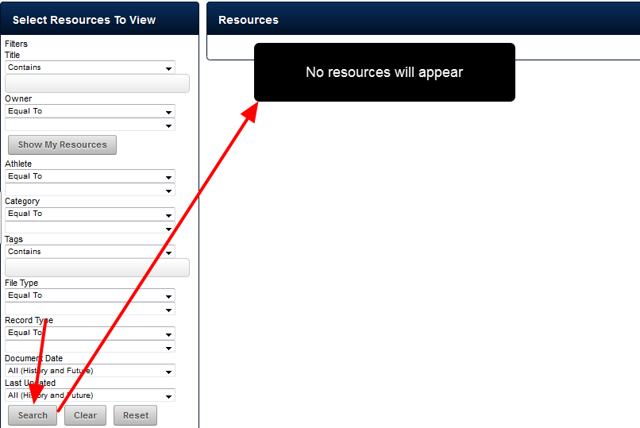 The example here shows that when the Physiotherapist next logs into the system and goes to the My Resources Module, they can access all Resources stored within each category that has been assigned to the Physiotherapy Role, and any other Roles that they have been given permission to access. 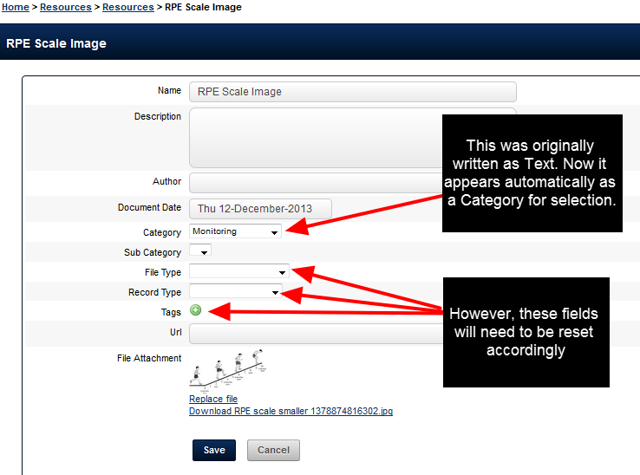 To open a Resource, simply click on it and it can be downloaded (as shown in the image in the step below). Prev: Why do we need Categories (Folders) to be set up on the Administration Site?